The problem: after establishing an IPsec VPN tunnel all traffic is routed to the remote endpoint, while I only need to route the packets destined to that internal network and still be able to access the internet on my local machine. Currently, when I enable the according VPN connection - all connectivity drops, meaning it's not possible to reach this machine over my LAN or access the internet through it (there is a restriction on the remote end for further WAN forwarding). So, only the VPN works in this case. I'm using OpenSwan on a Debian-based distro and also behind NAT (traversal enabled). As you can see - the machine is connected over WiFi on wlan2 and this is the interface that is taking part in the VPN setup. So, what would you suggest doing, in order to solve the problem of losing internet access after enabling the tunnel? Thank you. with this line you tell openswan that the endpoint of the tunnel is "everything", so all packets are routed through the vpn. 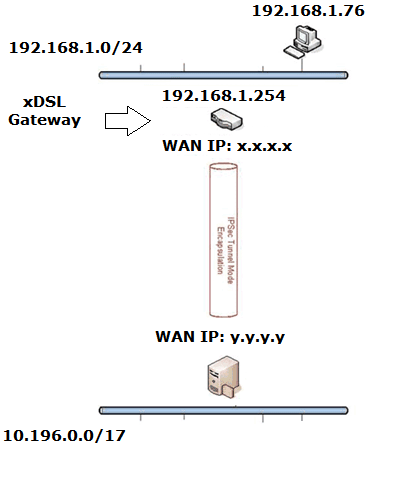 Replace 0.0.0.0/0 with the network(s) you want to reach behind the gateway. The config on the client and server has to match, so edit both. Not the answer you're looking for? Browse other questions tagged linux vpn routing ipsec tunnel or ask your own question.